The book actually consists of two stories. If you flip the book over, the other story reads in the other direction, so that when you come to the last page of either side you are confronted with the last page of the other story upside down. I don't know if they still do this in grade school, but back in the seventies they sold these little "scholastic books" through the school via a little mail order deal-ee-oh. I remember each year I would wait with such anticipation for the little pamphlet to come out to see which new books I could buy. They rarely cost more than a buck in those days. 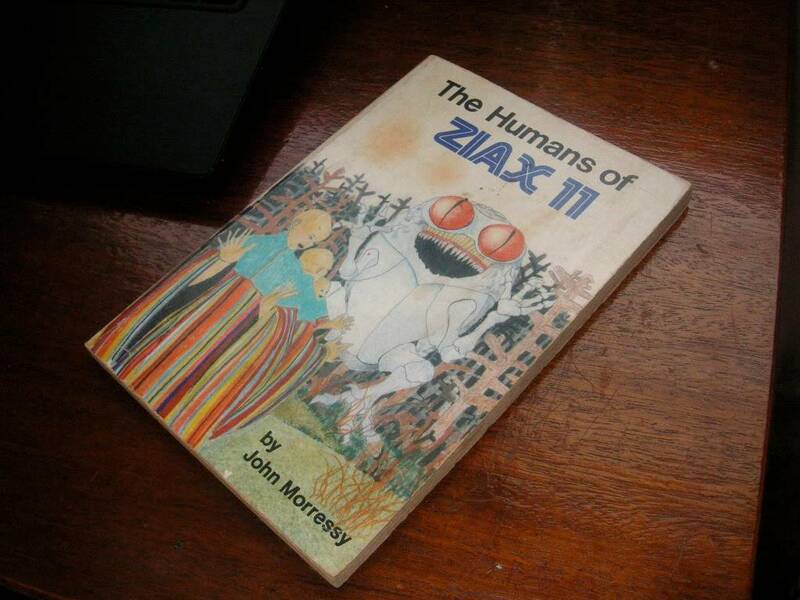 Anyway, this little science fiction ditty was my very first ever science fiction book, my baptism, so to speak. My very first sci-fi book was Madeline Lengal's A Wind in the Door. I still have it too. lol Not the exact same copy, I've had to replace it many times. I still love it and I still read it once a year. In the beginning...there was JR Tolkein, Terry Brooks, and Piers Anthony. That transfered to Ann McCaffrey and Robert Heinlien. Who in turn, turned me onto Stephen King and Dean Koontz. They sent me over to check out John Saul, who introduced me to Ann Rice. By then I was completely smitten and could not bare to read anything other than my beloved sci-fi/horror/fantasy novels. Yep, me too. Galactic Derelict by Andre Norton. I struggled in school, especially with reading. Fell asleep every time I tried to read anything...academic, pleasure, even comic books. Part of the problem was being an unusually slow reader; it made all reading drudgery. I was about 12-13 when I saw an intriguing book cover on a small paperback that was selling for 25 cents at a church bazaar. It was a tough decision; five candy bars or one book. (Yes, candy bars were a nickel each in 1960.) I bought the book. Started reading it around noon on Saturday and finished it before dinner on Sunday. That's when I fell in love with sci-fi and learned that reading in general could be fun. I don't recall exactly what my first sci-fi book was, but I believe it was either Dune or 2001: A Space Odyssey. And I remember those little scholastic books--used to beg my mom every time that pamphlet came out. I remember the first one of those that was bought for me. It was The Poky Little Puppy. Dean, I looked for that book last weekend at the library. I think I'm gonna have to buy it if I can't find it soon. ERBs Chessmen of Mars. I stayed with both Chess and fencing well into my 20's!